Like all good things common to man, social media can be either a distraction or a blessing. It depends on what we do with them. Some say they take too much time — which tells me they may not be familiar with tools such as Twitter or Facebook. Resisting social media and being unengaged in online community is safe but unwise. The gospel was not lost in the move from the scroll to the book, and it won’t be lost in the move from the page to hypertext. Social media are helpful tools that many in your congregation are already using — and your church (including its leadership) needs to be a part of that. As I consider social media in the twenty-first century, I can’t help but think of the spread of the gospel and the church’s growth in the first century. Communication was greatly aided then by the common language of Koine Greek. Since the New Testament was written in a language accessible to so many, the Word of God was able to penetrate different cultures rapidly. Perhaps today the new media will be the “common language” for the masses to hear the gospel. I have never been a fitness addict. In school, I didn’t like sport. I played Basket ball for a while, but was never good at it. I really don’t like running. I have never really been fit, but neither have I been unfit. nevertheless, in the last few weeks, I have come to realise I need to get back into shape a bit, so I have decided to go running regularly. I’ve bought some shoes, shorts and t-shirt and am looking forward to my first run. Although I know I’ll be out of breath after a few hundred yards, and will probably start regretting my decision. But I’ll try. I’ll let you know how it goes. Today I am looking after Maxime. Esther has gone to Bristol zoo with Jean-Baptiste and the school. The weather is gorgeous. Maxime and I have had a great time this morning. We went to Cathays on the train to make some photocopies, even with the cost of the train it is cheaper than using my inkjet printer. Then we went to the Bank and the post office in Whitchurch. Maxime is now sleeping so I am making the most of it, reading and blogging along. The others will be back around 4pm and I’ll be going to Swansea later, speaking in Libanus. 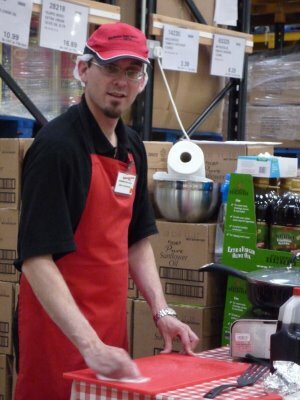 Over the last two years, I have been working for a company called Warehouse Demo Services, doing in-store product demonstrations in our local Costco. It has been good and has given me a lot of flexibility. WDS is an agency, so I was giving them my availability, and if there was work, I could have some, if I couldn’t work for any reason, I didn’t have to work. But the drawback was that there was no holidays, and that our income could vary quite a lot. But also the first three month of the year were very quiet with very few shifts. It has been an interesting experience, and I have met all sorts of people I would never have met otherwise. I have demonstrated all sorts of products as well, from French cheeses to washing powder, from Coffee to “healthy” Fryer. For example, last week I demonstrated Avocados one day, today Mozzarella Cheese and semi-dried tomatoes. I’ll certainly miss the people I worked with as well as the Costco members (Costco does not have customers, but members). One thing I won’t miss is the uniform I had to wear, the gloves and hairnet. I’ve also been handling food, and so had to shave for that. I’ll be able to grow my beard again, which is great as I can’t stand having to shave every day. The picture left is quite old, since then, I had to shave my face completely. On that day I was cooking Tuna steaks with Soya sauce if my memory is correct.